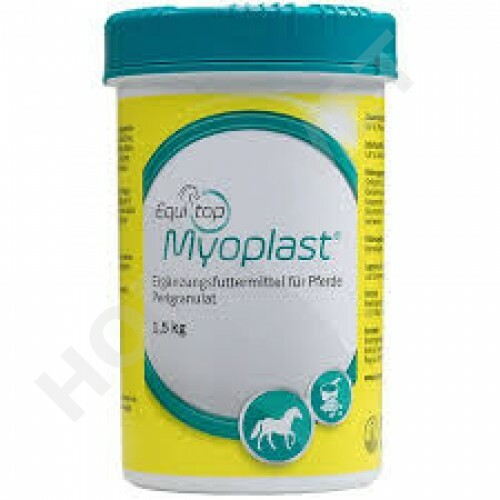 Equitop Myoplast® is a nutritional supplement designed to maintain muscle function in horses. The vegetable raw material of the product is derived from algae and provides a unique combination on 18 amino acids, including, L-Lysine, L-Threonine, DL-Methionine and L-Tryptophan. components. The granules are specifically processed to ensure consistent quality of delicate ingredients. does not contain any doping relevant substances. Mix Equitop Myoplast with the normal feed and feed for at least 4 weeks. During intense performance periods the daily ration may be doubled.